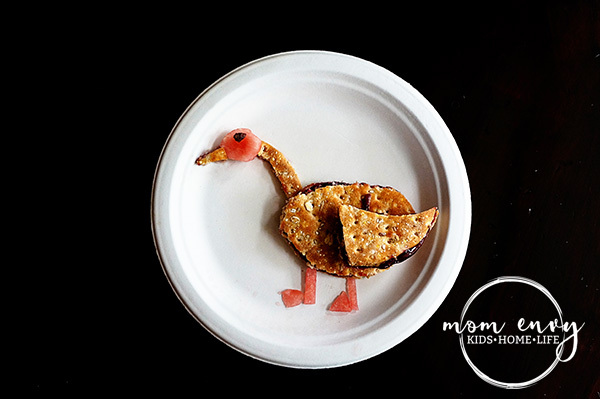 For Carl’s lunch, I was inspired by the geese we see constantly around our house. There is a nearby lake that the geese flock to so they fly over our house often. My husband has been working with Carl to get him to honk when he sees them. Carl’s favorite lunch is PB&J with watermelon. 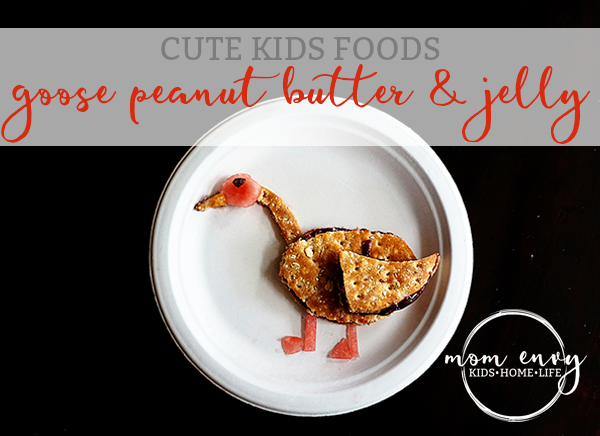 Aside from being Carl’s favorite food, it’s the perfect meal to style into an adorable animal! Cut an oval shape body for the goose. From the remaining piece, cut a long curved neck. Cut a small triangular beak. There will be some remaining sandwich left. I just gave that to Carl with his meal. Cut 2 long rectangles for legs. Cut 2 feet similar to a triangle (to make them appear webbed). Now it’s time to assemble. Place the 1 rectangle for the leg in the center bottom of the plate. Place the second leg to the right of that leg, slightly spaced out. Place the rectangular body in the middle/right, overlapping the watermelon slightly. Add the wing on top, letting it hang over the main sandwich just a little bit to the right. Put on the neck, head, beak, and feet. Cut the raisin in half. Place as an eye. Next articleToddler Muffin Recipe – The Best Ever Recipe that your Kid Will Actually Eat!